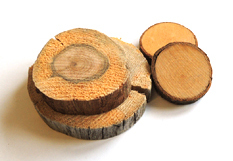 Slices of rough wood in assorted sizes. As they dry out, they can get a little powdery, so store in plastic! This entry was posted by Dana Sheridan. Bookmark the permalink.